Out of the Darkness Into the Light? Throughout Ryley’s life she has been in a number of physical therapies—first to help treat her hypermobility and then for various sports injuries. Each time though the outcome was predictable and although we didn’t know the exact details (how long it would take, what exercises would be involved, and so on) we did know, anticipate, and understand the future outcome. In each case it was to return to a previous state of normal—life before shoe inserts or life before a cast or brace. Even with her hearing aid, she was returning to her prior state of being before the illness that damaged her ear drum. The process was unknown, but the outcome was certain. Autism therapy though has always been focused on a goal we haven’t reached yet, a plane we haven’t yet been on, or an experience we have yet to have. Because the future is unknown, each accomplishment has been met with a new set of challenges, anxieties, or difficulties. For example when Caden learned to count, he learned that numbers predictably occur in a particular pattern. He loved to count but couldn’t handle when he encountered house numbers or price tags where the numbers were out of order. Driving down the road was one colossal meltdown because the numbers were simply out of order and not how they were meant to be. Picture systems, pointing, and gesturing were eventually replaced with language. This was monumental and I naively only expected leaps and bounds forward. It never occurred to me that with speech therapy would come the recognition that others are supposed to understand and properly respond when you speak. 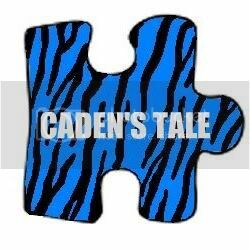 As Caden realized that others didn’t always answer the questions or respond to the statements he made, he became frustrated, anxious, and self-conscious to the point that he actually reverted back over the summer to a system of grunts and growls. The language system, like numbers, was black and white to him—you talk and others respond. There wasn’t any room for articulation errors, misinterpretations, or just not hearing all that was said. It’s almost as though he had to go from total darkness to intense lightning—not only did he have to learn the words but also how to say them and when to say them. So much to process in the rapid-fire interaction we call conversation. We are encountering a similar phenomenon now with both reading and emotions. He has latched onto the idea that letters make sounds that make words. He loves the sounding out process and is obviously proud when he successfully reads a word. But now we are encountering letters and sounds that don’t make actual words (like abbreviations) or random letter coding that doesn’t really mean anything and this brings with the accomplishment a whole new set of anxieties and worries. Although we’ve always had proof in our world of the biological origins (as opposed to purely mental) of autism, the very fact that we can correlate his difficulty with sleeping of late with his new found reading ability is further proof of how pervasive this diagnosis really is throughout his little body. When the switch from darkness to light occurred, his brain has a new set of activities or functions to obsess over. A year ago Caden couldn’t recognize any emotions and refused to recognize any attempts of teaching them to him. Reading has opened up a love of books which has helped ease us into more emotion word. His in-home therapists are amazing about incorporating this set of goals into each session. He can now recognize emotions, a range of emotions, and the fact that they are all around him. But he doesn’t understand emotional regulation any more than he understands vocal volume control (he can either be loud or whisper so quietly you can’t hear a word but nothing in between). He doesn’t yet know how to respond to emotions in others nor does he have the vocabulary to engage in those conversations. He also doesn’t have any sense of discrete differences so like is love and dislike is hatred and there isn’t much room in between. Everything is an emotion and it is all intense. The fact he has realized emotions and states of being of those around him is an amazing accomplishment but again it was one that I naively walked into, not realizing that recognition is only one part of the puzzle, it’s not the entire picture. So we’ve given him the keys to a car he can’t drive yet and with that comes a lot of tears, misunderstandings, hurt, frustration, anxiety, and over the top happiness. We will always continue to work toward the future—that’s what we do for our kids. But it’s a hard pill to swallow when you realize every accomplishment, every movement forward, must be accompanied by a new level of painful awareness and a few steps back. I suppose to fully appreciate the view from the mountain tops, you have to learn to appreciate the bumps, rocks, and foggy view down in the valley; after all it is all just a part of Caden’s tale.